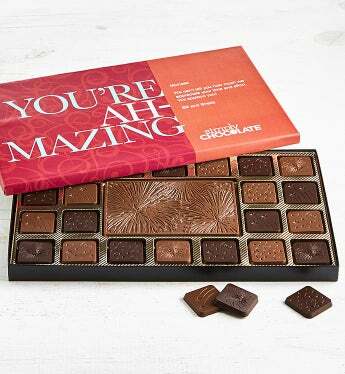 Say "You're Ah-mazing" in premium Belgian chocolate with this unique 45 piece box. Add your own message printed right on the box lid for a truly personal expression of your thoughts. They'll remember the box long after the chocolates are devoured. Kosher, OU-D.
Say "You're Ah-mazing" in premium Belgian chocolate with this unique 45 piece box. Add your own message printed right on the box lid for a truly personal expression of your thoughts. They'll remember the box long after the chocolates are devoured. 1 lb of chocolate. Kosher, OU-D.